Each epoch has unique characteristics for climate and geography. The plants and animals changed from epoch to epoch also. The beginning of this period was very warm and moist compared to today’s climate. Much of the earth was tropical or sub-tropical. Palm trees grew as far north as Greenland! By the middle of the tertiary, during the Oligocene Epoch, the climate began to cool. This cooling trend continued and by the Pliocene Epoch an ice age had begun. The plants of the Tertiary are very similar to the plants that we have today. The warm climate at the beginning of the period favored dense forests. As the climate cooled open woodlands and grasslands became abundant. 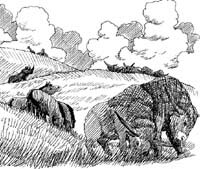 The grasses were important because they supported huge herds of grazing animals. The extinction event at the close of the Cretaceous Period wiped out the dinosaurs, large reptiles, and many other species. This left room for new animals to develop. The mammals became the dominant animals. In fact, the Cenozoic Era is often called the Age of Mammals. 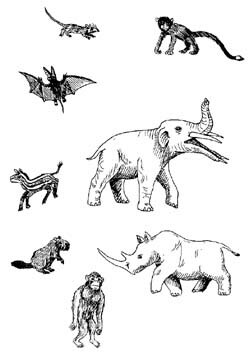 Most of the main groups of mammals were present by the Eocene Epoch. With the dinosaurs and other large reptiles gone mammals grew in size, numbers and diversity. They filled ecological niches in the sea on land and in the air. The table above shows what mammals came on the scene with each new epoch. During the Pliocene the first hominids appeared; these were our human ancestors! Birds did almost as well as mammals during the Tertiary Period. Many of the birds we know today were present. 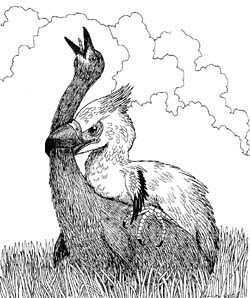 There were also many large flightless birds that are now extinct. These birds did particularly well before the mammals developed so many species. Fish species branched out during the Tertiary Period. Sharks became more plentiful. Trout and bass evolved. The insect population increased in the Tertiary Period. Bees and other insects that lived on pollen and nectar of the flowering plants prospered. This enabled migrations of both plants and animals across these land bridges. The Tertiary period which had begun hot and humid, ended in a cold dry ice age.